On average, 2000-watt lights produce between 350 and 400 watts of electricity per hour. They provide enough coverage for 14 to 16 plants. 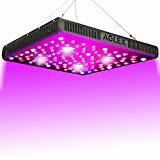 We love the BESTVA DC Series Grow Light because it has the lowest price per watt and the best coverage. At 24 inches, it covers a 7.8ft x 7.5ft grow bed. 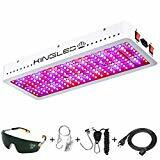 While its counterpart, the King Plus 2000W Full Spectrum Grow Light produces 375 watts per hour, it is pricier and its coverage is not worth writing home about. 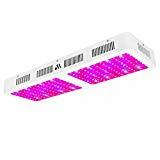 Next to the BESTVA light, the Dimgogo 2000W Grow Light has the best coverage.